For DjangoCon 2015, Jeff Bradberry created an A.I. for our booth game, Ultimate Tic Tac Toe. Reprinted here from jeffbradberry.com is his explanation of the Monte Carlo Tree Search used to build the A.I. The problem with Minimax, though, is that it can take an impractical amount of time to do a full search of the game tree. This is particularly true for games with a high branching factor, or high average number of available moves per turn. 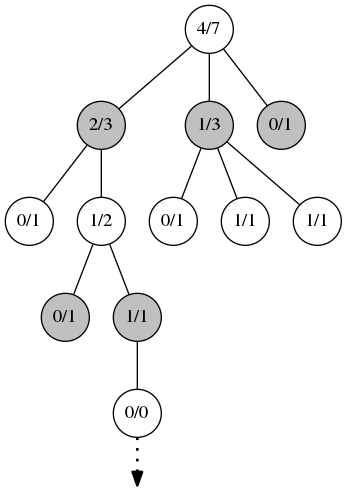 This is because the basic version of Minimax needs to search all of the nodes in the tree to find the optimal solution, and the number of nodes in the tree that must be checked grows exponentially with the branching factor. 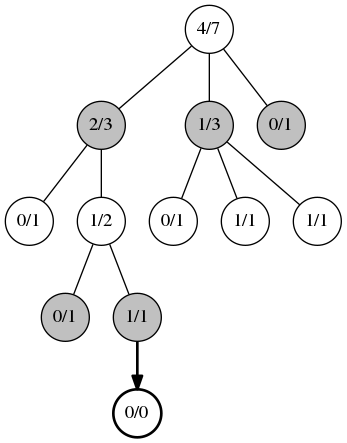 There are methods of mitigating this problem, such as searching only to a limited number of moves ahead (or ply) and then using an evaluation function to estimate the value of the position, or by pruning branches to be searched if they are unlikely to be worthwhile. Many of these techniques, though, require encoding domain knowledge about the game, which may be difficult to gather or formulate. And while such methods have produced Chess programs capable of defeating grandmasters, similar success in Go has been elusive, particularly for programs playing on the full 19x19 board. However, there is a game AI technique that does do well for games with a high branching factor and has come to dominate the field of Go playing programs. It is easy to create a basic implementation of this algorithm that will give good results for games with a smaller branching factor, and relatively simple adaptations can build on it and improve it for games like Chess or Go. It can be configured to stop after any desired amount of time, with longer times resulting in stronger game play. Since it doesn't necessarily require game-specific knowledge, it can be used for general game playing. It may even be adaptable to games that incorporate randomness in the rules. 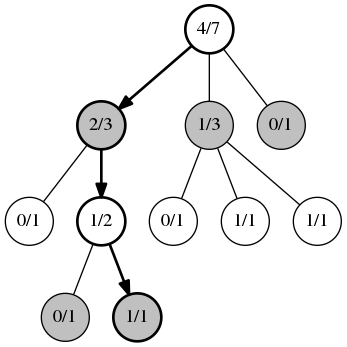 This technique is called Monte Carlo Tree Search. In this article I will describe how Monte Carlo Tree Search (MCTS) works, specifically a variant called Upper Confidence bound applied to Trees (UCT) , and then will show you how to build a basic implementation in Python. Then, your strategy is to pick the machine with the highest upper bound each time. As you do so, the observed mean value for that machine will shift and its confidence interval will become narrower, but all of the other machines' intervals will widen. Eventually, one of the other machines will have an upper bound that exceeds that of your current one, and you will switch to that one. This strategy has the property that your regret, the difference between what you would have won by playing solely on the actual best slot machine and your expected winnings under the strategy that you do use, grows only as O(lnn). This is the same big-O growth rate as the theoretical best for this problem (referred to as the multi-armed bandit problem), and has the additional benefit of being easy to calculate. And here's how Monte Carlo comes in. In a standard Monte Carlo process, a large number of random simulations are run, in this case, from the board position that you want to find the best move for. Statistics are kept for each possible move from this starting state, and then the move with the best overall results is returned. The downside to this method, though, is that for any given turn in the simulation, there may be many possible moves, but only one or two that are good. If a random move is chosen each turn, it becomes extremely unlikely that the simulation will hit upon the best path forward. So, UCT has been proposed as an enhancement. The idea is this: any given board position can be considered a multi-armed bandit problem, if statistics are available for all of the positions that are only one move away. So instead of doing many purely random simulations, UCT works by doing many multi-phase playouts. The first phase, selection, lasts while you have the statistics necessary to treat each position you reach as a multi-armed bandit problem. The move to use, then, would be chosen by the UCB1 algorithm instead of randomly, and applied to obtain the next position to be considered. Selection would then proceed until you reach a position where not all of the child positions have statistics recorded. Selection. Here the positions and moves selected by the UCB1 algorithm at each step are marked in bold. Note that a number of playouts have already been run to accumulate the statistics shown. Each circle contains the number of wins / number of times played. The second phase, expansion, occurs when you can no longer apply UCB1. 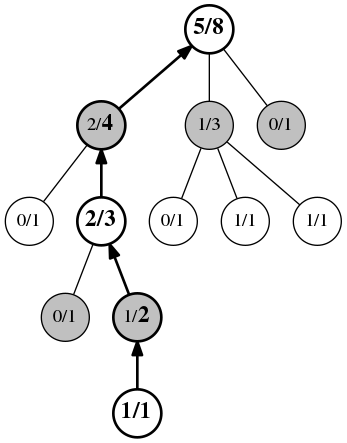 An unvisited child position is randomly chosen, and a new record node is added to the tree of statistics. Expansion. The position marked 1/1 at the bottom of the tree has no further statistics records under it, so we choose a random move and add a new record for it (bold), initialized to 0/0. After expansion occurs, the remainder of the playout is in phase 3, simulation. This is done as a typical Monte Carlo simulation, either purely random or with some simple weighting heuristics if a light playout is desired, or by using some computationally expensive heuristics and evaluations for a heavy playout. For games with a lower branching factor, a light playout can give good results. Simulation. Once the new record is added, the Monte Carlo simulation begins, here depicted with a dashed arrow. Moves in the simulation may be completely random, or may use calculations to weight the randomness in favor of moves that may be better. Finally, the fourth phase is the update or back-propagation phase. This occurs when the playout reaches the end of the game. All of the positions visited during this playout have their play count incremented, and if the player for that position won the playout, the win count is also incremented. Back-Propagation. After the simulation reaches an end, all of the records in the path taken are updated. Each has its play count incremented by one, and each that matches the winner has its win count incremented by one, here shown by the bolded numbers. This algorithm may be configured to stop after any desired length of time, or on some other condition. As more and more playouts are run, the tree of statistics grows in memory and the move that will finally be chosen will converge towards the actual optimal play, though that may take a very long time, depending on the game. For more details about the mathematics of UCB1 and UCT, see Finite-time Analysis of the Multiarmed Bandit Problem and Bandit based Monte-Carlo Planning. # Returns a representation of the starting state of the game. # Takes the game state, and the move to be applied. # Returns the new game state. # are legal plays for the current player. # the game is tied, return a different distinct value, e.g. -1. For the purposes of this article I'm not going to flesh this part out any further, but for example code you can find one of my implementations on github. However, it is important to note that we will require that the state data structure is hashable and equivalent states hash to the same value. I personally use flat tuples as my state data structures. # Takes a game state, and appends it to the history. # current game state and return it. # then updates the statistics tables with the result. Let's begin with the initialization and bookkeeping. The board object is what the AI will be using to obtain information about where the game is going and what the AI is allowed to do, so we need to store it. Additionally, we need to keep track of the state data as we get it. The UCT algorithm relies on playing out multiple games from the current state, so let's add that next. Here we've defined a configuration option for the amount of time to spend on a calculation, and get_play will repeatedly call run_simulation until that amount of time has passed. This code won't do anything particularly useful yet, because we still haven't defined run_simulation, so let's do that now. This adds the beginnings of the run_simulation method, which either selects a move using UCB1 or chooses a random move from the set of legal moves each turn until the end of the game. We have also introduced a configuration option for limiting the number of moves forward that the AI will play. You may notice at this point that we are making a copy of self.states and adding new states to it, instead of adding directly to self.states. This is because self.states is the authoritative record of what has happened so far in the game, and we don't want to mess it up with these speculative moves from the simulations. Now we need to start keeping statistics on the game states that the AI hits during each run of run_simulation. The AI should pick the first unknown game state it reaches to add to the tables. # who moved into that particular state. Here we've added two dictionaries to the AI, wins and plays, which will contain the counts for every game state that is being tracked. The run_simulation method now checks to see if the current state is the first new one it has encountered this call, and, if not, adds the state to both plays and wins, setting both values to zero. This method also adds every game state that it goes through to a set, and at the end updates plays and wins with those states in the set that are in the plays and wins dicts. We are now ready to base the AI's final decision on these statistics. # Bail out early if there is no real choice to be made. # Pick the move with the highest percentage of wins. # Display the stats for each possible play. We have added three things in this step. First, we allow get_play to return early if there are no choices or only one choice to make. Next, we've added output of some debugging information, including the statistics for the possible moves this turn and an attribute that will keep track of the maximum depth searched in the selection phase of the playouts. Finally, we've added code that picks out the move with the highest win percentage out of the possible moves, and returns it. But we are not quite finished yet. Currently, our AI is using pure randomness for its playouts. We need to implement UCB1 for positions where the legal plays are all in the stats tables, so the next trial play is based on that information. # variable lookup instead of an attribute access each loop. # If we have stats on all of the legal moves here, use them. # Otherwise, just make an arbitrary decision. The main addition here is the check to see if all of the results of the legal moves are in the plays dictionary. If they aren't available, it defaults to the original random choice. But if the statistics are all available, the move with the highest value according to the confidence interval formula is chosen. This formula adds together two parts. The first part is just the win ratio, but the second part is a term that grows slowly as a particular move remains neglected. Eventually, if a node with a poor win rate is neglected long enough, it will begin to be chosen again. This term can be tweaked using the configuration parameter C added to __init__ above. Larger values of C will encourage more exploration of the possibilities, and smaller values will cause the AI to prefer concentrating on known good moves. Also note that the self.max_depth attribute from the previous code block is now updated when a new node is added and its depth exceeds the previous self.max_depth. So there we have it. If there are no mistakes, you should now have an AI that will make reasonable decisions for a variety of board games. I've left a suitable implementation of Board as an exercise for the reader, but one thing I've left out here is a way of actually allowing a user to play against the AI. A toy framework for this can be found at jbradberry/boardgame-socketserver and jbradberry/boardgame-socketplayer. This version that we've just built uses light playouts. Next time, we'll explore improving our AI by using heavy playouts, by training some evaluation functions using machine learning techniques and hooking in the results. UPDATE: The diagrams have been corrected to more accurately reflect the possible node values.